As nationals in Antigua and Barbuda celebrate the birthday of the Father of the nation Sir Vere Cornwall Bird Snr. today (Wed), the airport named in his honor was also abuzz with activity on the occasion of the inaugural flight of interCaribbean Airways. The new terminal at the V.C. 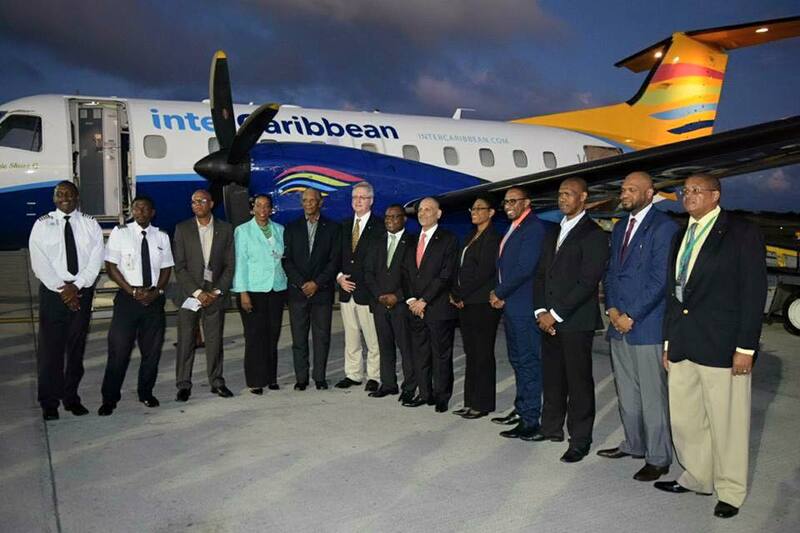 Bird International airport saw the arrival of interCaribbean Airways’ new service which commences scheduled flights from Antigua to Santo Domingo’s Las Américas International Airport (SDQ) and Tortola’s Terrence B. Lettsome International Airport (EIS). interCaribbean Airways arrived to the usual pomp and ceremony associated with such events from the water canon salute to the meeting of arriving passengers by an official welcome party. Minister of Tourism, Economic Development, Investment and Energy the Hon. Asot A. Michael, along with Permanent Secretary within the said Ministry, Mrs. Paula Frederick Hunte and other Tourism and Aviation officials were present airside to greet the Chairman of interCaribbean Airways, Mr. Lyndon Gardiner, the CEO of interCaribbean Airways, Mr. Trevor Sadler and passengers as they departed from the aircraft. Also journeying on the inaugural flight was Chairman of the Antigua and Barbuda Tourism Authority, Mr. Rohan Hector and the CEO of the Authority, Mr. Colin C. James. At the official welcome ceremony, the Hon. Minister of Tourism expressed his elation with the commencement of the service. “This new service is incredibly exciting for Antigua and Barbuda and our new V.C Bird International airport, as it further strengthens our position as an aviation hub in the Caribbean. Antigua and Barbuda is now also in the perfect position to offer visitors and residents one-stop connections to the Bahamas, Panama, Cuba, Jamaica and their home base in the Turks and Caicos Islands by partnering with interCaribbean Airways”, stated Minister Michael. The company which operates a fleet of EMB 120, Twin Otter and BE99 aircraft has its sights set at further expansion as a result of its new collaboration with the government and people of Antigua and Barbuda. “Today marks the first time for our company to begin operation of scheduled flights in the Eastern Caribbean with this new service to Antigua. We look forward to bringing our service to the region, and with the support of the community, will continue our growth. Our services begin the path to creating connections between the Eastern and Western Caribbean regions” said Mr. Lyndon Gardiner, Chairman of interCaribbean Airways. This is the third such ceremony to be held at the new terminal opened in August this year. Seats are now on sale, and bookable immediately at interCaribbean.com, by calling their reservations centers, or by visiting their airport locations or Customers may also visit their preferred travel agency.